Based on the hugely successful but now largely forgotten Kevin Costner film of the same name, Robin Hood: Prince of Thieves for the Nintendo Entertainment System was the rare sort of movie-to-game adaptation that was not only decent in its own right, but probably provided an even better experience than its source material. Quite a cut above the typical Acclaim or LJN license-based garbage of the time, it was developed by Sculptured Software and published late in 1991 by Virgin Games, several months after the film's debut. The game featured most of the events of the movie, from Robin's initial escape from prison alongside Azeem, to the climactic crashing of the wedding between the Sheriff of Nottingham and Maid Marian. To flesh out the quest, numerous subplots were added in the form of various missions, wherein the player might be tasked with taking down Nottingham's subordinates, or gathering resources to strengthen Robin's forces. The title was most notable for its multiple modes of play, with the primary mode being a top-down adventure that was vaguely derivative of The Legend of Zelda. Compared to Zelda, the level designs were spare, enemy variety was lacking, and there were no puzzles of any sort. It was more focused and linear, however, with clear and immediate objectives in a mission-based structure. Stages would begin in the Sherwood Forest camp, where Will Scarlet would provide instructions. Instead of a consistent overworld, each mission had a specific map that would begin as soon as the player left camp. Robin Hood would then wander through the forest or castle environment, collecting items along the way and running into enemy officers as well as wild animals, before eventually stumbling upon the destination. Control was tight and Robin could move freely in eight directions, but could attack in only four. Since enemies would often approach at an angle or even fire arrows diagonally, some finesse was required to outflank them before delivering the killing blow. 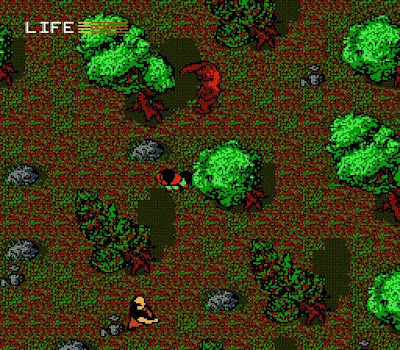 The most annoying aspect of the adventuring was the overly-sensitive collision detection on the environment, causing Robin to often bump into and get snagged on random protruding pixels. While it was more of an action game than a true adventure, it also featured some basic RPG elements, such as stats and equipment. While the sword would be the main weapon throughout the game, there were a few other options that helped to give combat some variety. In keeping with the legend, the bow and arrow was probably Robin Hood's deadliest weapon, but also very useful was Little John's quarterstaff, which could be spun continuously around the body, rendering the player invincible against any enemy that lacked projectiles. Robin could only carry a limited number of items, and each one lowered his agility rating. This was where his merry band came into play. The player would only ever control Robin Hood, but the implication was that he was actually accompanied by his allies on every mission, and, in fact, each of these characters had a full set of stats and equipment slots accessible in the menu. In practice, they served no purpose except to carry the party's loads, so that Robin himself could be kept at peak agility. Punctuating the adventuring were the duels and melee battles. Most boss fights occurred as one-on-one duels between Robin Hood and the story's key villains, who were all trained swordsmen. These were rather shallow affairs, using a side view to show the characters jumping, ducking, and rolling clumsily around the stage. Because none of the characters were capable of striking at anything below shoulder level, nearly all fights, including the final sword fight against the Sheriff of Nottingham, could be won by luring the opponent to higher ground, then slashing their legs from below without fear of reprisal. 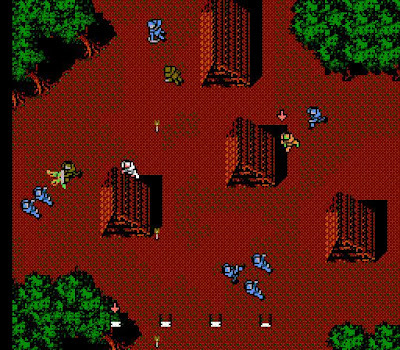 More notable were my favorite segments in the game, the melee battles, where the game shifted to a bird's-eye view, while Robin and his band took on waves of enemy forces coming from all directions. These brief affairs were no more sophisticated than the duels, with simple controls and enemies that died in a single hit. The satisfaction derived from the godlike ease with which the player could mow down dozens of foes at a time, while accompanied by some intense music. It prefigured the one-against-hundreds action of Dynasty Warriors and its ilk. These battles were also the only times where Robin's AI-controlled allies would take an active part in the gameplay. Finally, there were a few horseback stages, where the player had to ride toward the right at high speed, jumping over obstacles to avoid instant death. The player character would be positioned uncomfortably close to the right edge of the screen, leaving little time to spot the hazards before jumping, but they always arrived in a repeating pattern. While these were some of the title's more thrilling moments, the game offered no instructions for this mode, and it was not immediately obvious that the player had to manually press right on the directional pad. The first riding stage didn't offer much time to grasp these mechanics before Robin's pursuers caught up with him and dumped him to the ground dead. Speaking of instructions, I remember the game's manual listing peculiar items such as the "Claymore" and "Locksley Shield," which I had never come across in multiple playthroughs. In fact, the game contained no shields whatsoever. As a child, however, I was naively inclined to believe that a game's included instructions contained accurate information, so, for years, I wondered where these items could possibly be hidden, to the point where I even had a dream that I found the Claymore. At the time, however, I didn't know what a claymore actually was, so, in my dream, it took the form of a hardened turd that could be frisbeed at enemies. Lest you think me completely insane, I should point out that the dream was probably partly inspired by a classroom conversation, where one girl claimed to have used cowpies as discuses back on her farm. In any case, this game may have been one reason why I no longer bother to read instructions. One other thing that always bothered me was that the graphics for the Sheriff of Nottingham had seemingly been mixed up with those of his cousin, Guy of Gisborne. 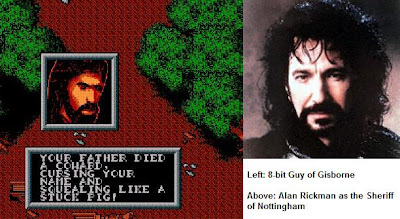 In the film, the Sheriff of Nottingham was played by a bearded Alan Rickman, and, in the game, both the character portrait and dueling sprite for Guy of Gisborne bore a strong resemblance to Rickman's Nottingham. The long-haired Nottingham of the game, meanwhile, was probably closer to the film's Guy, played by Michael Wincott. I speculated that the developers may have confused themselves after having adjusted the characters' respective roles in the plot. Guy of Gisborne's role in the game was much more prominent than it had been in the movie, where he was a minor subordinate killed for his ineptitude by Nottingham. In the game, he was the villain who personally took credit for the murder of Robin Hood's father, and the player had to defeat him in a duel to win the powerful Locksley Sword. In the film, the sword of Robin's father was wielded by the Sheriff of Nottingham in the climactic duel. Looking at the graphics now, it's apparent that none of the characters particularly resembled their film counterparts, so it may all have been a strange coincidence. 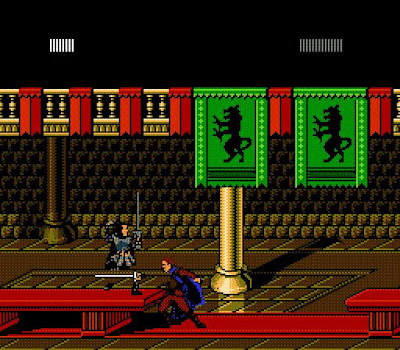 Even so, it still strikes me as odd that Guy of Gisborne should have had a completely unique character sprite, while the more integral Sheriff of Nottingham was a mere palette variation of the generic enemy swordsman graphic. Clocking in at about four hours of game time, it was not a short playthrough by the day's standards, yet there was no way to record progress, meaning that it had to beaten in one sitting. There was a hidden password menu, where key phrases could be entered to jump to any chapter, but the characters would have only the bare minimum stats and equipment for that section of the game. Robin Hood: Prince of Thieves held a place of honor in my NES collection, thanks to its addictive action, incomparable variety of play, and balanced difficulty level. That it was based on one of my favorite movies as a kid was a mere bonus, and, looking back, I have much stronger memories of the video game than of the film. The stigma of licensing has probably unfairly kept it from achieving a greater legacy, but it is a classic worthy of recognition. The game was later ported to the Game Boy by B.I.T.S. I haven't played this version extensively, but it seems to be a straight and, all things considered, a pretty solid conversion. The melee battles suffer the most, as the system's screen size is not large enough to fit the entire battlefield on one screen, requiring some scrolling about to get at offscreen attackers. Using the old password code to jump to the end, I was initially quite delighted upon seeing that the Sheriff of Nottingham's sprite had been replaced in this version with the one formerly used for Guy of Gisborne, but, after checking the other duels in the game to make sure, I found that actually all of the swordsmen now used that same sprite. Oh, well. 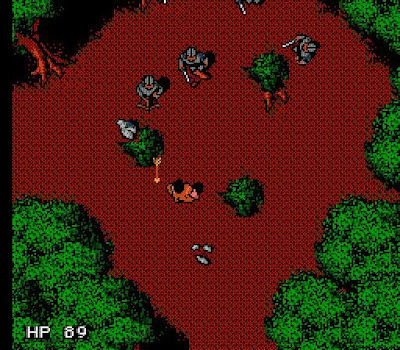 More than a decade after the game's official release, a prototype NES ROM titled "The Legend of Robin Hood" showed up on the Internet. The rough code is not really playable, but this is definitely the game that eventually became Robin Hood: Prince of Thieves. The final game's quality was probably helped by the fact that Sculptured Software was already working on it before the film license was attached.